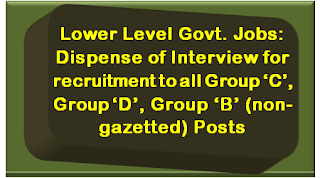 The Government of India has decided to dispense with the interview for recruitment to all Group ‘C’, Group ‘D’ (which are now reclassified as Group ‘C’), Group ‘B’ (non-gazetted) and all equivalent posts from 1st January, 2016 in its Ministries/ Departments/ Attached offices/ Subordinate Office/ Autonomous Bodies/ Public Sector Undertakings. All the advertisement after 01.01.2016 for future vacancies are required to be without interview as part of the recruitment process for such posts. Further, it has been made clear that since the skill test or physical test is different from interview, such tests may continue. However, these tests are only qualifying in nature. 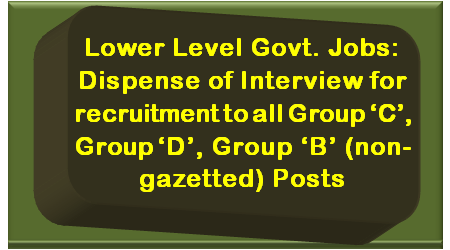 It has further been decided that in case of specific posts for which any particular Central Ministry/ Department considers interview absolutely essential, clearance of Department of Personnel & Training (DoPT) would be obtained. Staff Selection Commission, a major central recruitment agency, has discontinued interview for all Competitive Recruitment Examinations w.e.f. 1.1.2016. State Governments and Union Territories have also come forward and initiated steps for discontinuation of interviews in junior level posts. As per information available so far, 21 States and 7 Union Territories have adopted the policy of discontinuation of interview in lower level posts.